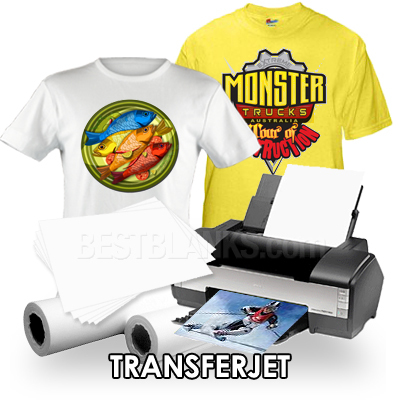 Inkjet Transfer Paper For Professionals & Beginners! 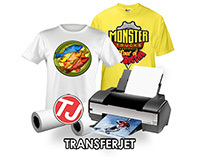 TransferJet InkJet heat transfer paper is easy-to-use, images well, is easy to peel, won't bleed and images remain sharp and crisp. 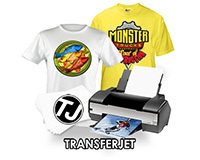 TransferJet inkjet transfer paper works on all fabrics, from tight weaves such as the top of mouse pads or shirts to heavy materials like tote bags. Our inkjet transfers (on shirts) have a soft hand and will soften up further after the first wash. Retail transfer papers are more expensive and will not perform as well. We offer hot peel inkjet transfers. These type of inkjet heat transfers have the shortest application time and produces a professional matte finish. A matte finish is most desirable/popular for shirts, mouse pads, caps, etc. Cold peel transfers take much longer to complete and produces a shiny finish and is not recommended for mouse pads because it leaves the surface tacky (sticky). If you want a shiny transfer finish on shirts you can achieve this with our "TransGloss" transfer paper. See this page for more details. *IMPORTANT: Our heat transfer papers have been tested and run successfully on most standard brands of inkjet printers and color copiers/printers when the correct heat transfer paper is selected for the above mentioned equipment. Customer is solely responsible for making selection of heat transfer paper. We make no claims or guarantees as to its suitability for any specific printer or copier. Always test to determine the suitability of the paper for use in conjunction with your equipment and methods. The seller’s and manufacturer’s maximum obligation shall be to replace any paper which has been proven defective. Neither the seller nor the manufacturer of this paper shall be liable for any injury/damage, direct or consequential, arising out of, or the inability to use this paper. Print results may vary on different ink jet brands, color copiers/printers and/or models. Output quality is dependent upon the user’s hardware, software and general knowledge and ability to use graphic and/or photo manipulation programs. Experimentation with your specific equipment may be necessary. Following the printing/application instructions is critical to achieve best results.